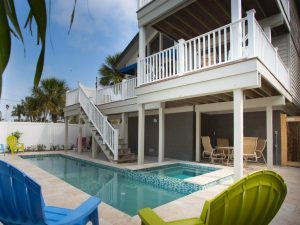 “Jewel of the Isle” – A very private three story beach house located in Pass-a-Grille, a quaint barrier island community just 15 minutes from downtown St Petersburg and 30 minutes from Tampa Airport. Beautiful Private Swimming Pool in the back yard with unique and private, tropical, outdoor shower! The quiet historic Pass-A-Grille neighborhood is away from the crowds and the typical beach vacation experience. Just a few steps away from the front door of the house, the award-winning beach offers gentle waves and white powder sand. Enjoy sunsets from the living room or upper deck.